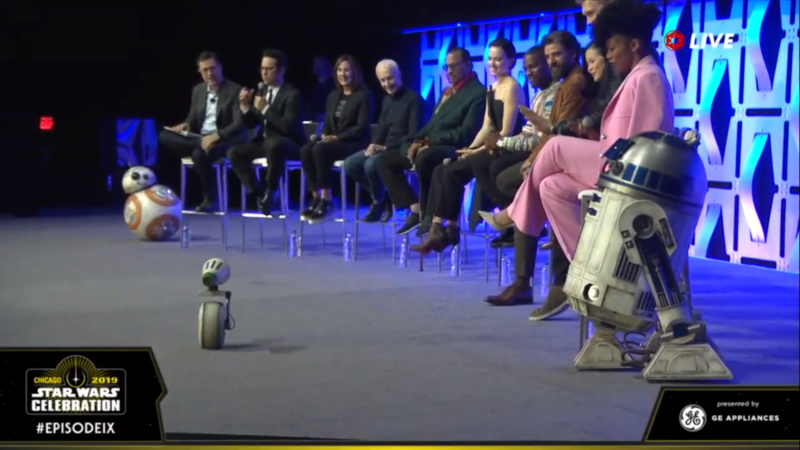 The first panel for this year’s Star Wars Celebration Chicago was entirely focused on the final installment of the sequel trilogy. With Abrams, Kathleen Kennedy, and the cast present for the first real reveal for episode IX, the purported finale to the Skywalker Saga. Hosted by The Late Show’s Stephan Colbert. So throughout the panel we got several nice photos of the sets and costumes and the character name for Naomi Ackie’s character: Jannah. So the teaser, first thing is first; we get a good look at Rey as a Jedi knight while Luke monologues about the legacy of the Jedi being on her shoulders. Rey’s lightsaber is repaired though given Daisy keeping it vague in the panel makes one wonder if she will get another one. The planet that was shot in Jordan features heavily, there is still no real way of telling if it is a location we have seen before, though it really easily could be Tatooine. We see all kinds of tech in the sequence there with our heroes fighting against some sort of TIE speeder, jetpacked Stormtroopers, whilst riding a very cobbled together speeder. During the panel several aliens were shown, some of which appear to be connected to the Resistance given gear similarities. With the new alien in the picture with Snap being confirmed by JJ to be an ally of the Resistance. Seeing more alien diversity among the heroes is always good. The Resistance itself does not feature in full force directly, but what seems to be an A-wing landing at a Resistance stronghold city is shown, as well as those aforementioned aliens shown during the panel who seem to have Resistance-esq gear. There is also Kylo fighting against Resistance troopers in a forest. There is also a sequence with an A-wing flying through a battle by what seems to be a Resistance or Republic (given the colors) Imperial Class 1 Star Destroyer. Kylo is not wearing his helmet in the forest fight, however we do know he will be using it after it is repaired with some red glue holding it together. The teaser shows a furry-handed short creature fixing the helmet, though I have no clue if that corresponds to any revealed aliens for the film. 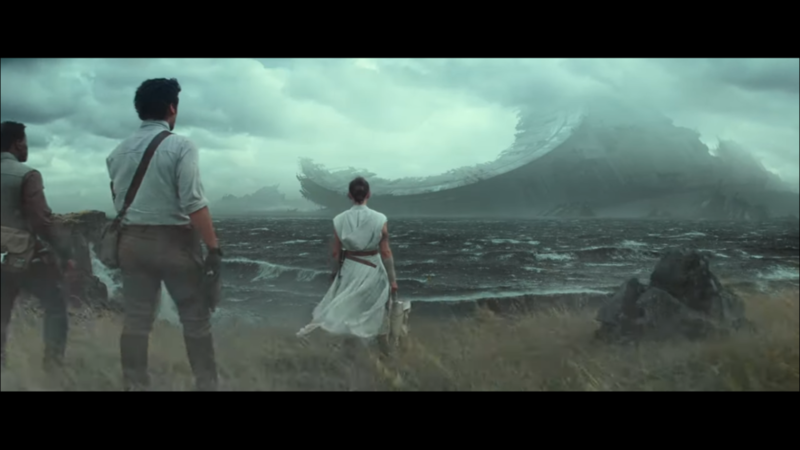 Said forest may actually be Endor, which almost certainly is the location of that final shot with what seems to be a chunk of the Death Star IIs dish. The idea of a partly submerged DSII was something tossed around during the earliest concept art days for The Force Awakens. A glimpse of how Leia will be worked into the film using footage of Carrie from TFA is shown. It seems there was a scene of her looking at Han’s Medal of Bravery from A New Hope, as well as inserting IX Daisy into the scene in which the two hug from TFA..
Rose does not appear to be in the teaser, however the panel did provide a photo of how she will look in the film, and it appears she will still be a part of the main cast. She has not been in many set photos which gave pause to some, however ideally this is just due to the sheet depth of content we are yet to see. Billy Dee Williams was present at the panel, with a photo of him on set being show; though eclipsed by the moment in the trailer with him laughing while flying the Falcon with Chewie. As for the Sheev in the room - the seeming return of Palpatine with that laugh at the end. I never, ever thought they would actually go that far and have Palpatine pull a Dark Empire and return from the beyond. There could still be twists and turns but this…..this is if nothing else one hell of a surprise. Dark Empire, love it or hated, has become a punching bag over the years, at times simply over bringing Palpatine back. It is nice to see the concept getting new life, it was an idea Lucas was on board with after all when Veitch did it in the 90s. Any story can work, you just have to make it work. On a final note, the title: Rise of Skywalker. Much like The Last Jed there are so many possible meanings and/or subjects for that the title could refer to. The safest bet is that Skywalker is symbolic, continuing on from Episode 8 with the theme of Luke becoming a legend fully.